Is the Western Wall Judaism's Holiest Site? 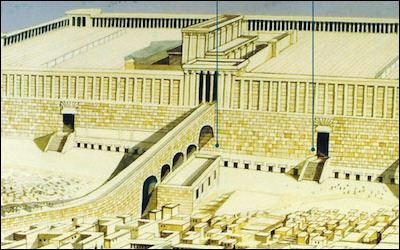 An artist's reconstruction shows where today's Western Wall (the area between the two dark vertical lines) lies in relation to the temple complex of antiquity. For centuries, it was the upper portion, the Temple Mount, where Jews made their pilgrimages and prayers, even when it lay in ruins. Few beliefs have resonated more widely, or among a more diverse set of Israelis and Jews, than the perception of the Western Wall as Judaism's holiest site, the place where they feel the greatest sense of sacredness, "the holy of holies of Jewish national unity" to use the words of the Wall's rabbi, Shmuel Rabinowitz. Chief rabbi of Jerusalem Shlomo Amar has similarly asserted that "no one can annul the holiness of the Western Wall, not the government, not the courts." But when did the Western Wall become the holiest Jewish site? Historical evidence suggests that the Temple Mount was actually Judaism's "holy of holies," and that the Western Wall's venerated position is a relatively late development with a more prosaic and even non-Jewish origin. Would these facts change the tenor of the debate about the Western Wall's future status? And can they help ameliorate the widening schism between Israel's Orthodox religious establishment and the Diaspora Conservative and Reform movements over this holy site? The Second Temple in Jerusalem was for centuries the central site for Jewish worship, which was mainly sacrificial at that time. Although the temple itself was built and completed in 515 B.C.E. by Judeans who had returned home from the Babylonian exile, a major refurbishing of the temple was begun by the Roman client-king Herod the Great around 19 B.C.E. Today's Western Wall is actually only a small portion of the retaining wall erected by Herod to encase the natural hill known as Mount Moriah or the Temple Mount in order to allow for the creation of an enormous platform upon which the revamped temple stood. Once the Second Temple was demolished by the Romans in the year 70 C.E., prayer replaced sacrificial worship. Most scholars agree that Jews offered prayers on the Temple Mount even after the destruction of the Second Temple. "During the first period after the destruction of the Temple of Herod, the Jews continued to go and weep at the ruins of it," read a report by the British Royal Commission, established in 1930 to determine the claims of Muslims and Jews at the Western Wall. The report also noted that "the Jews' wailing-place at that time seems to have been the stone on Mount Moriah where the Mosque of Omar now stands." Roman emperor Hadrian put down a bloody Jewish insurrection in Judea, circa 132–36 C.E. The emperor punished the Jews by barring them from the Temple Mount for their prayers. Yet there is no indication that they prayed at the Western Wall of today. But before long, all this changed. 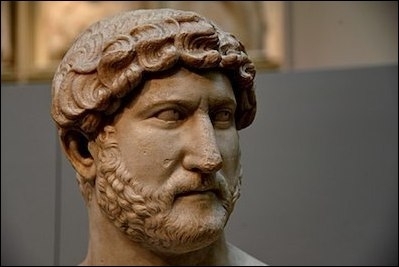 Early in the second century the Roman emperor Hadrian prohibited Jews from worshipping on the Temple Mount. They were permitted to assemble for prayer only on the Mount of Olives from where they had an unobstructed view of the ruins of the Second Temple. The prohibition to ascend the Temple Mount was strictly enforced during Hadrian's lifetime, but the periodic need to re-issue the decree by subsequent emperors suggests that enforcement was often lax after his death. In fact, Jews did pray on the Temple Mount during the remainder of the second and most of the third centuries, but even when they were prohibited from doing so, there is no indication that they chose instead to pray at today's Western Wall. Once the Roman Empire adopted Christianity as its official state religion in the fourth century, the situation of Jerusalem's Jewish community became precarious. During most of the next three hundred years, Jews were not permitted to live or visit Jerusalem, but there were periods when this anti-Jewish policy was relaxed, and Jews were permitted to live in or visit the city. Yet there are no records of Jews praying at the Western Wall during those years. After the Persian and Arab conquests of the city in the seventh century, Jews were again allowed to reside in Jerusalem. They chose to live on Mount Zion where they had a number of synagogues. They even had a synagogue on the Temple Mount but no prayer services were conducted at the Western Wall. In the mid-11th-century, Jews prayed at all of the retaining walls of the Temple Mount. The Western Wall was not accorded any preference. An eleventh-century document, found in the Cairo Geniza describes how Jewish pilgrims frequently circled the Temple Mount (from the outside), stopping at each of the gates to recite specific prayers. Moshe ben Yitzhak, a mid-11th-century pilgrim, is reported to have prayed daily at one of the Temple Mount gates. At that time, Jews prayed at all of the retaining walls of the Temple Mount. The Western Wall was not accorded any preference. When they prayed at the Western Wall, they did not worship at the site that nowadays is known as the Western Wall Plaza but rather north of this area because, at that time, buildings prevented access to the area currently used. This same geniza manuscript from 1057 confirmed that the Jews paid special taxes for the privilege of praying at the Temple Mount gates and on the Mount of Olives. In front of the [Dome of the Rock] is the Western Wall. This is one of the [remaining] walls of what was once the Holy of Holies. ... All the Jews come there to pray before this wall. The wall that Benjamin described was not the present Western Wall (which, as previously noted, is part of the outer retaining walls of the Temple Mount) but the ruins of the western wall of the Second Temple, which were apparently still standing in his days. Maimonides, who arrived in Jerusalem in 1165, also prayed on the Temple Mount, but his letters make no mention of praying at the site where the Western Wall is now located. Rabbi Shmuel ben Shimshon, who arrived in Jerusalem in 1211, describes in great detail his first days in the city. He ascended the Temple Mount soon after arriving and often prayed on "the Mount of Olives, the place where they used to burn the [Red] Heifer." But on "Shabbat we prayed the afternoon prayer [on the Temple Mount], on the very place where the uncircumcised used to erect their idols." Again, no mention is made of praying at the Western Wall of our days. A circa fourteenth-century book of Holy Land geography states that Jews prayed at the eastern wall and outside the gates of the southern wall. Early in the fourteenth century, Jews were barred from entering the Temple Mount by the Mamluks, who ruled Jerusalem from 1250 to 1516. Ishtori Haparchi (1280-1366), author of one of the earliest books of the geography of the Holy Land, Kaftor v'Ferah, wrote that in his day, Jews prayed at the eastern wall and outside the gates of the southern wall. He describes the geography of Jerusalem in great detail but makes no mention of a holy site at the western wall. An Italian Jewish pilgrim, Meshulam Da Volterra, visited Jerusalem in 1481. He reported that on Tisha b'Av, the annual day of mourning for the destruction of the Temple, the Jews of Jerusalem went "up to Mount of Olives from there they see the Temple Mount, and there they weep and lament the destruction of this house." What is currently known as the Western Wall then is not mentioned in any source prior to the sixteenth century. It was not mentioned even once in either the Babylonian Talmud (completed in the fifth century C.E.) or the Jerusalem Talmud (completed about a century earlier). There exists an ancient tradition that "the Shechina [God's presence] will never move from the Western Wall." This saying could not refer to the present Western Wall but, instead, described the ruins of the western wall of the Second Temple building mentioned by many pilgrims, including Benjamin of Tudela. Over time, as the visible ruins of the original temple walls disappeared, this saying was applied to the current Western Wall. Suleiman the Magnificent ordered improvements, including clearing an area around the western side of the retaining wall that contained the Temple Mount, which he assigned to the Jews as a place for them to pray. Before that, today's Western Wall held no religious significance. In 1517, the Ottoman Empire captured the city of Jerusalem, bringing to an end almost three hundred years of Mamluk rule. 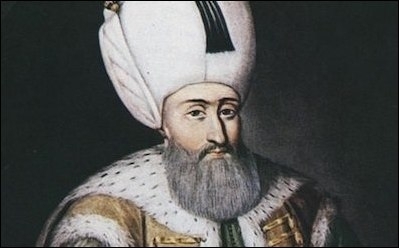 Sultan Suleiman I the Magnificent, whose reign from 1520 until his death in 1566 was the longest reign of any Ottoman ruler, was among the most prominent monarchs of his day. He conquered many Christian strongholds in Europe and was stopped only in 1529 when he failed to conquer Vienna. He subsequently turned his attention toward consolidating his gains in the Middle East. In 1536, he ordered the restoration of Jerusalem's city walls, which had been in ruin since the thirteenth century. Later, he undertook an extensive renovation of the Dome of the Rock. Suleiman adopted a positive attitude toward the Jews of his realm. He persuaded many who had been expelled from Spain and Portugal a generation earlier to settle in Jerusalem. Some believe that he encouraged Jewish immigration in order to limit the influence of the local Arabic-speaking population. Whatever his motives, Jerusalem's Jews benefited from his benevolence toward them. Fourteen years after he had ordered the rebuilding of the city walls, Suleiman instructed his court architect to prepare the area that came to be known as the Western Wall as a place for Jewish worship. Such a move became possible because on January 14, 1546, a severe earthquake hit the region. Hundreds of people were killed. The flow of the Jordan River was stopped for two days by a landslide. A tsunami battered the Mediterranean coast from Acre to Gaza. The area hardest hit by this earthquake in Jerusalem was the Temple Mount and the quarters surrounding it, including many of the houses that had been built along the western wall. These were the houses that had prevented access to most of the western wall. Now that the approach was blocked by ruins rather than by houses occupied by many people, Suleiman felt ready to instruct his engineers to clear the ruins and to prepare a Jewish prayer site at the western wall. in the author's day, and for many years thereafter, the Western Wall (where we pray nowadays) was covered with earth, and all the Jews went to pray at the eastern wall of the Temple Mount and outside the gates of the southern wall. The sacredness of the Western Wall is a relatively recent phenomenon and an outgrowth of Sultan Suleiman I's (r.1520- 66) rebuilding activities in Jerusalem. The site was originally just a narrow alley (above) that restricted its usage by the city's Jewish worshippers. No one is molested ... by the Mahomedans, as we have a very old firman from the Sultan of Constantinople that the approach [to the Western Wall] shall not be denied to us, though the Porte [the Ottoman government] obtains for this privilege an especial tax, which is, however, quite insignificant. Although Sultan Suleiman designated the Western Wall as a central locus of Jewish prayer, for more than four hundred years, this site was quite unlike the Western Wall that we know today. From the time of its inception in the sixteenth century until 1967, the site was only a narrow alley—on one side were the houses of the thickly settled Arab neighborhood known as the Mughrabi Quarter and, on the other, the retaining, western wall of the Temple Mount. The prayer area was only 4 meters wide and 28 meters long, occupying less than six percent of the western wall's total length of 488 meters. This small area could barely accommodate a few hundred people. In the first few centuries after the designation of the Western Wall as a place of prayer, it was utilized infrequently by its intended users. Early descriptions indicate that people came to the wall to pray for divine help only when they faced very critical problems. Another early custom was for some Jews to assemble at the wall during the nine days prior to the anniversary of the destruction of the First and Second Temples (Tisha b'Av) to recite the evening prayer and elegies. In the first few centuries after the designation of the Western Wall as a place of prayer, it was utilized infrequently. Others had the custom to come to the Western Wall on Thursday nights to recite tikkun hazot, a special prayer recited at midnight to ask for God's mercies. Another practice reported by some nineteenth century European travelers was for the pious to assemble on late Friday afternoon near the Western Wall to welcome the Sabbath. All of these customs make it clear that for many centuries the Western Wall was not used as regularly as it is nowadays when it is a bustle of activity, every day, all day long, and into the late evening hours. Every Shabbat morning, immediately after leaving the synagogue, [Jerusalem Jews] walked to the Western Wall, but actually [they did] not walk to the Western Wall because it was far away, and it was necessary to walk through the alleys and market places in white Shabbat coats ... but [they] walked to a certain alley where Jews live and, from a high spot one can see, beyond the Western Wall, the place of the Temple ... and there [they recited] those psalms that mention Jerusalem and Zion. This wall is visited by all our brothers on every feast and festival; and the large space at its foot is often so densely filled up that all cannot perform their devotions here at the same time. It is also visited, though by less numbers, on every Friday afternoon and by some nearly every day. 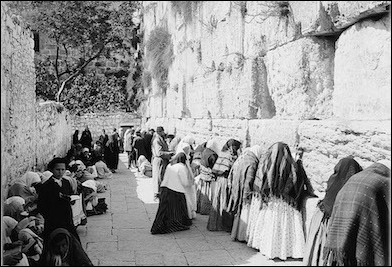 Albert Rhodes, U.S. consul in Jerusalem in 1863-65, described the prayers at "the wailing-place of the Jews ... [as] a spot of interest to every traveler" on Friday afternoon when "every available spot along the foot of this wall is occupied by weeping Jews." He added that "the greater part of these are women, who often sit in little circles around a Talmud-learned Jew, who reads to them ... portions of the Jewish chronicles." He also noted that "those [women] who arrive early ... commence at one end of the wall and kiss and touch every stone within reach, from one end of the wall to the other." Regular, daily, public prayer services, three times a day, did not take place at the Western Wall until late in the nineteenth century or early twentieth century. By 1941, they had become established and so popular that British-appointed chief rabbis Yitzhak HaLevi Herzog and Ben Zion Uziel felt it necessary to issue regulations for proper behavior at the wall. These rules included a prohibition against riding a bicycle through the alleyway; the strict separation of men and women (even though the Mandatory government did not permit the erection of the traditional barrier that separates the sexes in Orthodox synagogues); and an admonition not to start a second prayer service while a prior prayer service was already under way. The importance of the Western Wall as the most sacred Jewish site grew immeasurably in the days and weeks after the June 1967 Six-Day War. During Israel's 1948 war of independence, the Jordanian army occupied East Jerusalem and the Old City. The armistice treaty between Jordan and Israel required free access to the Western Wall for everyone, including Jews. However, between 1949 and 1967, Jordan violated this provision and prevented any Jew from approaching the Western Wall. An entire generation of Israeli Jews grew up without access to this holy place. The Israeli government tried to provide alternate sacred sites, such as King David's tomb on Mount Zion and the military cemetery on Mount Herzl, but the inability to access it made the Western Wall an even more venerated place. Then all of a sudden, in June 1967, the Israeli army recaptured the Old City, and the Western Wall once again became accessible to Jews. On June 7, 1967, the third day of the war, Israeli paratroopers recaptured the Temple Mount and immediately afterward descended to the Western Wall. They were soon joined by Rabbi Shlomo Goren, the chief army chaplain, who blew a resounding blast on the shofar (ram's horn) and said a prayer: "This is the day we have been yearning for. Let us rejoice in it." A few hours later, Israel's two chief rabbis and other senior rabbis came for a festive thanksgiving divine service. On this day, everybody who came to the Western Wall came by way of the Temple Mount because most of the Old City had not yet been cleared of Jordanian snipers. On the following day, while Israeli paratroopers were clearing the last pockets of resistance, David Ben-Gurion, who had retired four years earlier as Israel's first prime minister, came to the Western Wall accompanied by Jerusalem's mayor Teddy Kollek and Yaakov Yanai, the chairman of Israel's Nature and Parks Authority. Ben-Gurion, the mythological founder of the state of Israel and an avowed secularist, laid his head on the Western Wall and wept bitterly. Once he calmed down, he ordered one of his bodyguards to remove the sign reading "al-Buraq," the Arab name for the Western Wall. He then turned to Yanai and asked him, "Aren't you ashamed? Look—toilets next to the Western Wall." Yanai told Kollek about Ben-Gurion's comments and added, "We need to clean up this place. We need to get the Wall in shape." Kollek promised to take care of it. And he did. Within days the houses of the Mugrabi Quarter were leveled by bulldozers, and the narrow alleyway was turned into the open area known today as the Western Wall Plaza. Instead of the small area that could barely accommodate a few hundred worshippers, a new site had been prepared to accommodate many thousands. Some 370,000 people visited the new site during its first week. A week and a half after the Temple Mount and the Western Wall were recaptured, Moshe Dayan, Israel's defense minister, met with the Muslim religious authorities of Jerusalem in al-Aqsa Mosque. At this meeting, he announced that the Muslim authorities would be in complete charge of all religious activities in the mosques on the Temple Mount. Jews would have free access to the Temple Mount but would not be allowed to pray there. Instead he directed Jews to pray at the Western Wall. The Israeli government subsequently accepted Dayan's decision that forbade Jewish prayer on the Temple Mount. The rule was that Muslims pray on the top of the mountain while Jews pray below at the Western Wall. As has been made abundantly clear, there is no ancient Jewish tradition that designates the Western Wall as a sacred site. Instead, it was designated as a place of prayer less than five hundred years ago by a Muslim ruler. It took more than three centuries for the wall to attract the Jewish masses, and only in the last 150 years, has it become Judaism's "most sacred site." Yet, even if this place was not intrinsically holy (let alone as holy as the Temple Mount), or even if it had not been so designated by Suleiman the Great, it has become sanctified over time as Jews have increasingly utilized it for prayer. Whether this historical survey can help resolve the intra-Jewish dispute over the Western Wall, and whether it will affect the far more bitter feud between Israel and the Palestinians over the future of Jerusalem's holy sites remains to be seen. F. M. Loewenberg is professor emeritus at Bar-Ilan University's School of Social Work. Since his retirement, his research interests have focused on the history of the Temple Mount and the Western Wall. The Jerusalem Post Magazine, Sept. 16, 2016, p. 21. "Report of the Commission Appointed by His Majesty's Government in the United Kingdom of Great Britain and Northern Ireland, with the Approval of the Council of the League of Nations, to Determine the Rights and Claims of Muslims and Jews in Connection with the Western or Wailing Wall at Jerusalem, (Dec. 1930)," League of Nations, Geneva, pp. 10-1. F. M. Loewenberg, "Where Jerusalem Jews Worship: Tracing the changing location of the 'holiest' site in Judaism," Hakirah, Winter 2013, pp. 213-31. F.M. Loewenberg, "A synagogue on Har Habayit in the 7th century: Dream or historical fact?" Hakira, Summer 2016, pp. 253-62. Dan Bahat, "L'zehui sha'arey har habayit batkufa hamuslemit hakduma v'ha'me'ara'," Catedra, 106, 2002, p. 72; Bahat, "L'toldot hitkadshuto shel hakotel hama'aravi," Ariel, 2007, p. 33. Benjamin of Tudela, The Itinerary of Benjamin of Tudela (Jerusalem: Hebrew University, 1960, based on 1907 ed. ), p. 24. The red heifer or cow was burned on the Mount of Olives and its ashes used in a ritual purification ceremony. See Mishna Para; Maimonides, Hilchot Para Aduma. Avraham Ya'ari, Igarot Eretz Yisrael, 2nd ed. (Tel Aviv: Gazit, 1950), p. 78. Ishtori Haparchi, Kaftor v'Ferah, ed. J. Blumenfeld (New York: Beit Hillel, 1964), ch. 6. Avraham Ya'ari, Massa Meshulam m'Volterra b'Eretz Yisrael (Jerusalem: Mossad Bialik, 1959), p. 68. Midrash Exodus, Rabbah 2:2. Leopold Zunz dates the composition of this midrash to the 11th or 12th century while others date it two or three centuries earlier. Bahat, "L'toldot hitkadshuto shel hakotel hama'aravi," p. 35. Y. Barselvi, "The earthquake in Eretz Yisrael in January 1546," Bulletin for Study of Eretz Yisrael and Its Antiquities, 19 (1956), pp. 29-34. Bahat, "L'toldot hitkadshuto shel hakotel hama'aravi," pp. 38-40. Haparchi, Kaftor v'Ferah (Jerusalem: n.p., 1899), pp. 94-5. "Report of the Commission (Dec. 1930)." Joseph Schwartz, A Descriptive Geography of Palestine, trans. I. Leeser (Philadelphia: A. Hart, 1850), p. 260. See, for example, Ya'ari, Igarot Eretz Yisrael, pp. 205-6. Avraham Ya'ari, Massa'ot Eretz Yisrael (Ramat Gan: Masada, 1976), pp. 345-6. Schwartz, A Descriptive Geography of Palestine, p. 260. Albert Rhodes, Jerusalem As It Is (London: J. Maxwell, 1865), pp. 363-4. Keter Shem Tov, cited in Yaakov Gliss, Minhagei Eretz Yisrael (Jerusalem: Mosad Harav Kook, 1968), pp. 35-6. Jordanian-Israeli General Armistice Agreement, Apr. 3, 1949, art. 8. David Ben-Gurion, "Archives for 1967," Ben-Gurion University, Beersheba; "The secret of the disappearing Wall," Israel Hayom (Tel Aviv), June 3, 2016; Mordechai Naor, ed., The Jewish Quarter in Jerusalem (Jerusalem: Mossad Bialik, 1987), p. 112. Moshe Dayan, Story of My Life, (New York: Morrow and Company, 1976), pp. 387-90. See R. Meir Simha HaKohen (1843-1926), Meshech Hochma (commentary on the Pentateuch), Exodus 32:19. Related Topics: Israel & Zionism, Jerusalem, Jews and Judaism | F.M. Loewenberg | Fall 2017 MEQ receive the latest by email: subscribe to the free mef mailing list This text may be reposted or forwarded so long as it is presented as an integral whole with complete and accurate information provided about its author, date, place of publication, and original URL.